The Slieve Russell Hotel, Golf and Country Club is one Ireland's leading all round resorts offering guests both luxurious accommodation alongside plenty of excellent amenities meaning that everyone's needs are catered for during their stay. Set in the heart of 300 acres of glorious countryside, the serene and tranquil setting is the perfect place for guests to truly relax and escape the stresses of everyday working life. In addition to the state of the Spa and exquisite dining options - the hallmark of the course is the fantastic championship golf course which winds its way through the 50 acres of lakes that reside within the resort grounds and is an unforgettable playing experiencing. 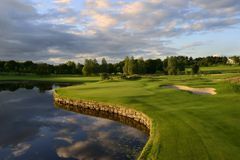 Forming part of a magnificent 300-acre estate, including 50 acres of lakes, the highly acclaimed 18-hole championship course at Slieve Russell incorporates the lakes and hills of the County Cavan landscape beautifully. The main features of the course are two large lakes which are connected by a stream. Water is, not surprisingly, a hazard on a number of holes. Slieve Russell has recently been voted as the best parkland course in Ireland for 2016 by 'The Irish Golfers Guide' & 4th Best parkland course in Ireland by 'Golfing Magazine'. At over 7,000 yards from championship tees, it is a challenge for even the best players, but there are multiple teeing areas to allow players of all abilities to enjoy a round. The 13th is arguably the signature hole. It's a fantastic risk-reward par-5 that winds around Lough Rud. The danger with the tee shot is how much water you should take on in order to reduce the distance of the hole and potentially reach the green in two. The Lough is full of balls from players who were too greedy! The Slieve Russell has hosted some major Irish PGA Tournaments. These include The Irish PGA Championship in 1996, won by Des Smyth, and also the Quinn Insurance PGA Charity Pro-Am. The Slieve Russell has also played host to European Tour events - North West of Ireland Open in 2001 & 2002. Located just 2 hours from Dublin city centre, the Slieve Russell Hotel Golf & Country Club in Ballyconnell, County Cavan offers a haven of comfort and relaxation in a tranquil setting. Set in 300 acres, including 50 acres of lakes, the Slieve Russell Hotel Golf & Country Club has a wide range of facilities in addition to golf, including the Ciúin Spa & Wellness Centre. Guests can indulge in a range of Elemis treatments for both men and women including an exclusive Ciúin Signature Facial and Ciúin Signature Body Treatment. You can also get away from the stress of everyday life and relax in our Jacuzzi, steamroom or sauna. The wide range of facilities also include three superb restaurants and a cleverly designed 20-metre swimming pool incorporating a therapeutic whirlpool and massage seats. There's also a fitness suite or you can take a relaxing stroll or jog around the magnificient Cranaghan Walkway, providing some excellent vantage points across the spectacular surrounding countryside. In addition to the bedrooms, the Slieve Russell Hotel provides offers 19 Suites and 2 Presidential Suites, all of which are impeccably furnished and designed to incorporate every comfort. Attention to detail is key and all rooms have TV with digital in-room entertainment and internet access. Many of the rooms have wonderful views over the golf course and the landscaped gardens, while some corner rooms have balconies - an ideal spot for breakfast or that pre-dinner drink.